I was confused. I was not able to make up my mind regarding the route I need to take. 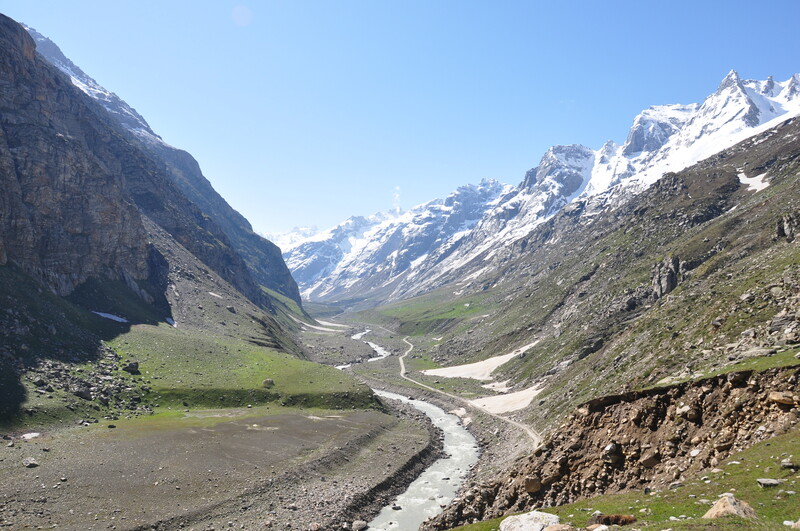 On one hand was an arduous three day journey back to Manali using the same route I used for the onward journey and on the other, unknown road with bad weather conditions, but a much shorter route to same destination. It was a classic “road less traveled” philosophical paradigm. 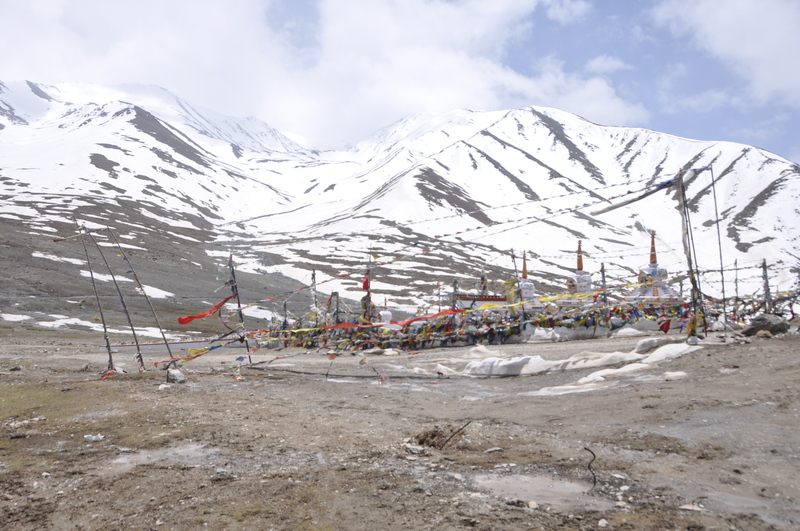 I decided that the decision would be taken on top of Kunzum pass. Late start did not help my cause. I had to rush ahead to Kunzum pass having no time to stop for photography. This was the first time in the trip I felt the need for company. 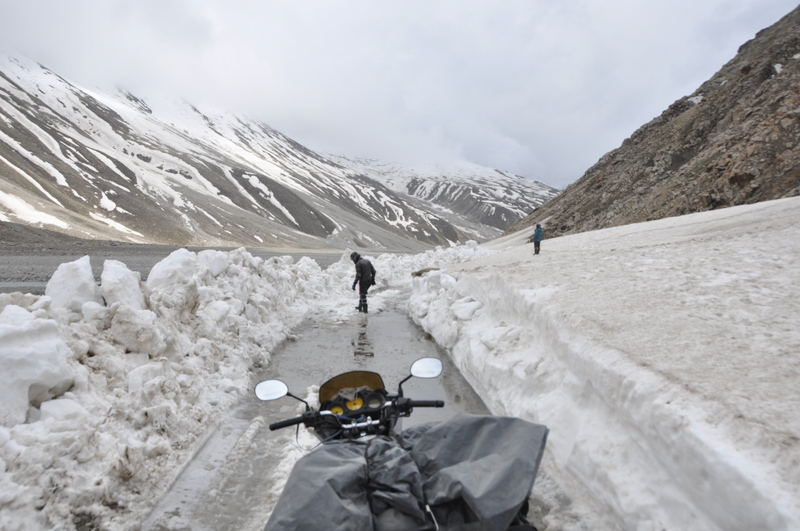 I was quite relieved at the sight of few bikers on the road to Kunzum pass. 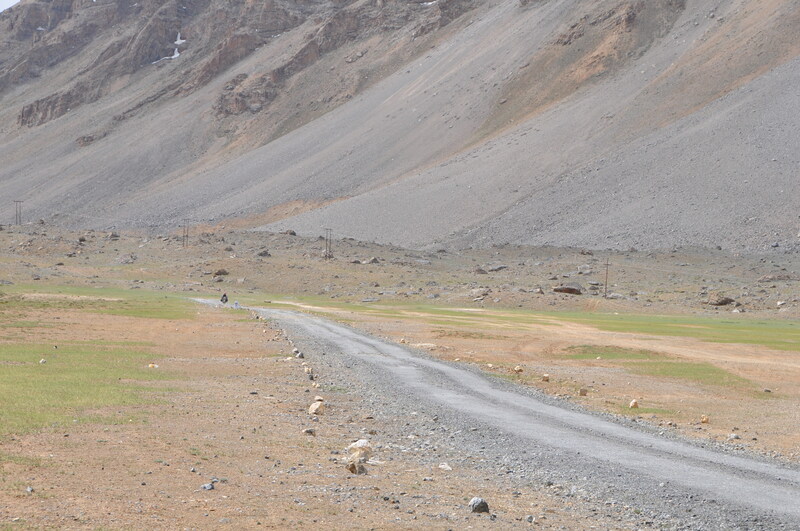 I realized that it was same group I had met earlier in Kaza and were on the way to Leh. One of the pillion riders of that group had fallen off the bike and was in pain. I offered him a crape bandage to wrap up his leg. This moment presented a great opportunity to gather the acquaintance of this group. 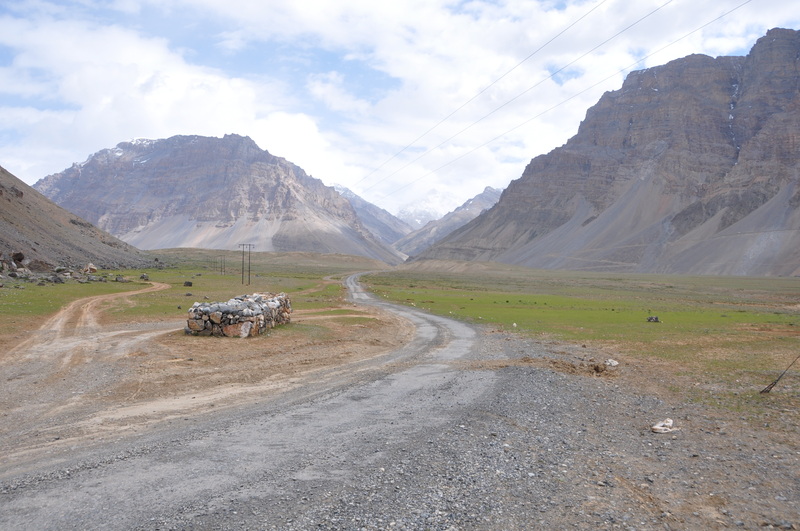 Having done my little part in helping fellow biker, I moved on to Losar (4079m), the last village of Spiti. The rest of bikers caught up with me for breakfast at the village. 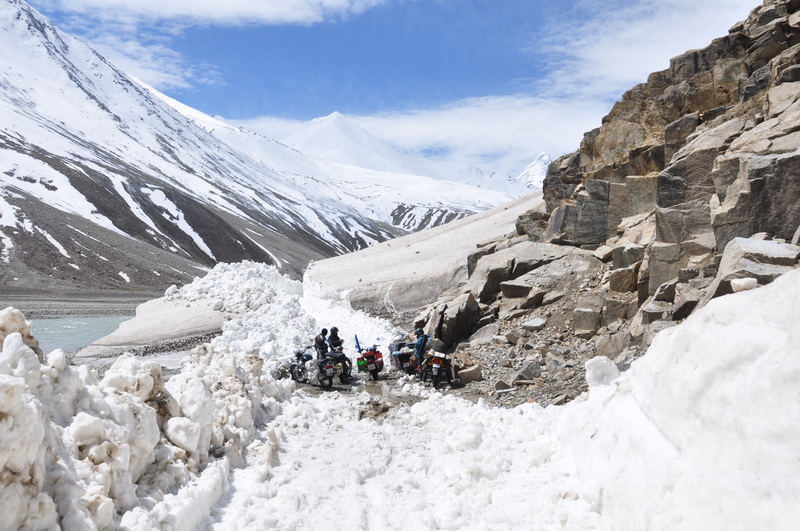 My impatience got the better of me, and I decided to head to Kunzum pass to find out about the road conditions ahead. My new friends promised to catch up with me at top of the pass. 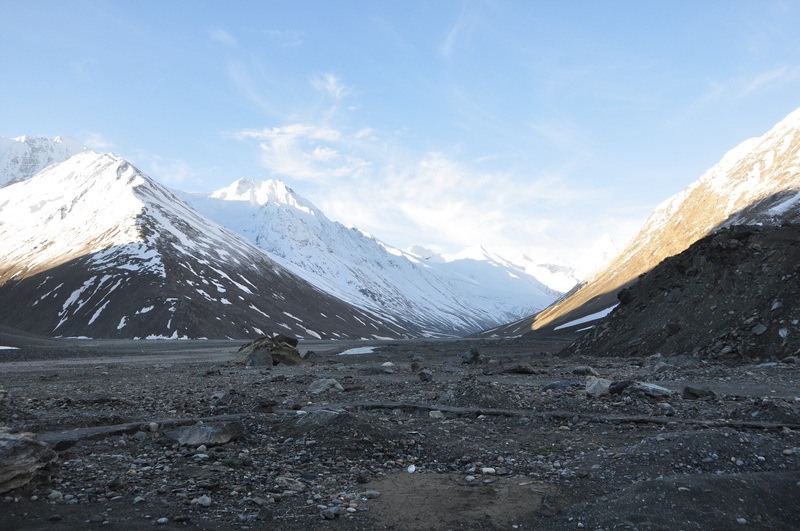 Little did I know that Kunzum pass would be a frozen deserted region! On reaching the top, I found an old abandoned Dhaba with an eerie look to it. The only other living things were few birds that seem to be amused at my presence. The strong cold wind started playing trick in my mind as I heard incoherent whispers. The altitude sickness must have got better of me. I tucked myself inside the broken down Dhaba and waited for my friends to arrive. That must have been the longest hour of my life spent in isolation with my brain almost ceasing to function. Thump! Thump! Thump! Ah! The sound of god blessed Royal Enfield finally ripped through the air. I rushed to the spot to intercept my friends. It was here that I made my decision to continue on the “warned” road with rest of these bikers. The worsening of climate was cause for worry. 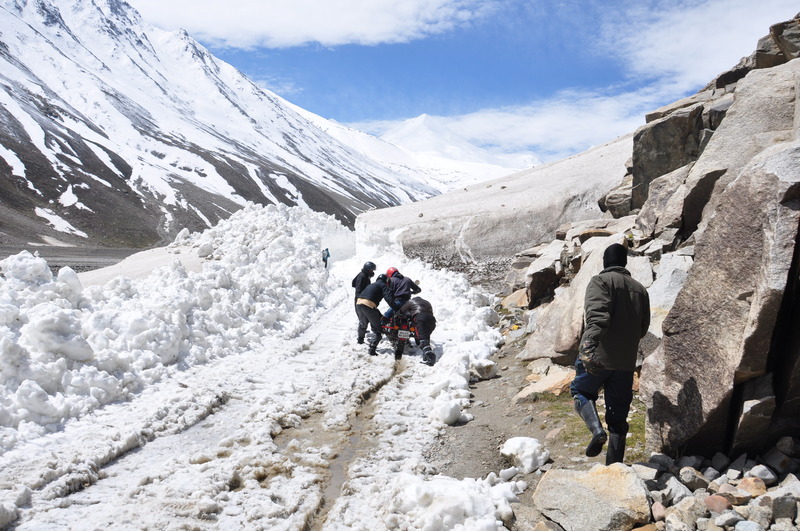 The initial slow decent form Kunzum was marred by small slippery glaciers which needed combined efforts of five to six people to get through. The cold weather made it very difficult to grip the bike handles resulting in few unfortunate falls. Despite few setbacks, the overall mood of the bikers was high. 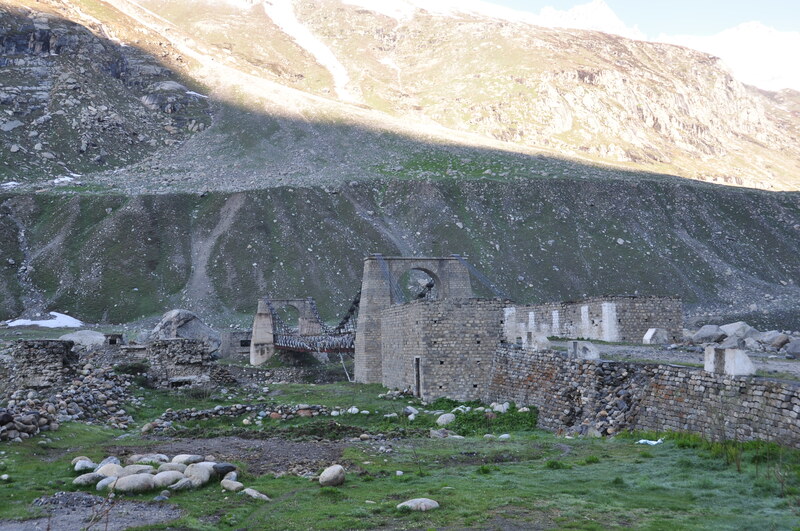 We reached Batal, the first little hamlet of Lahul. 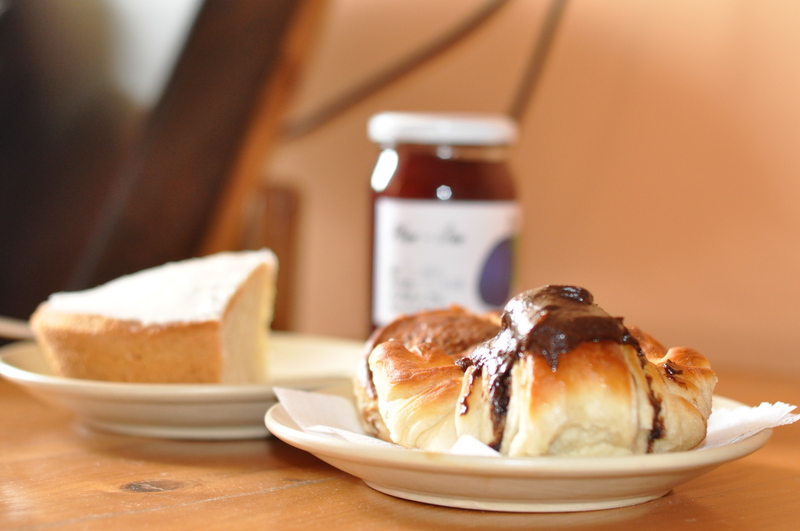 A Tibetan couple runs this place providing food and shelter for fellow travelers. 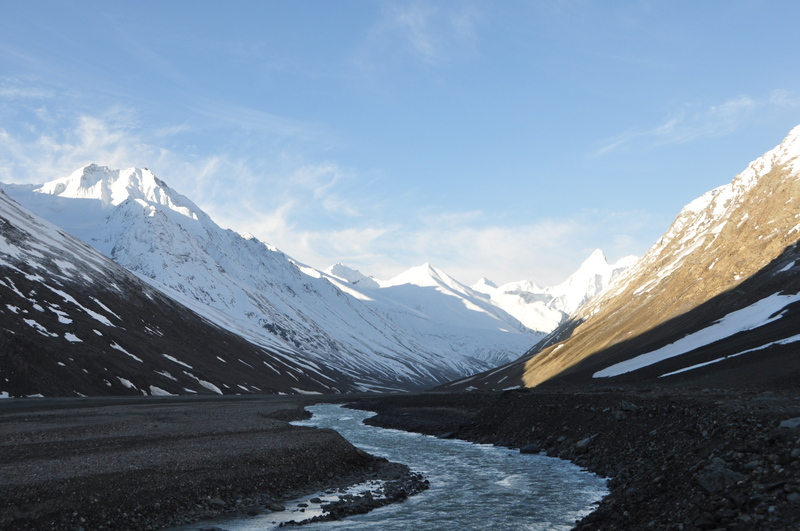 At this point an argument broke out within the group deciding between stop for the night at Batal versus going all the way to Keylong. It was hung jury. Finally, one of the members convinced the rest of us that we could go six kilometers ahead to the first glacier to check the conditions before making a decision. 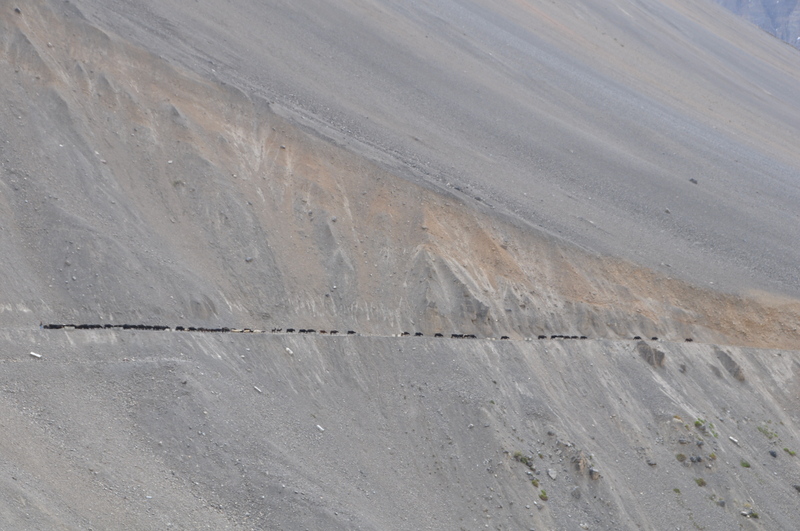 It took almost an hour to cover the six kilometers before we encountered the first glacier. We Spent The Night Inside That! To our surprise, there were two SUVs that were stuck in those glaciers and an emergency evacuation vehicle was working to pull the SUVs out. Sensing great delay with the procedure, we headed back to Batal for the night. This was perhaps the best decision of the day. No sooner we entered our camp, it started snowing heavily. We tucked ourselves in and before we knew it, fell asleep. Clear weather gave a great start to the day. 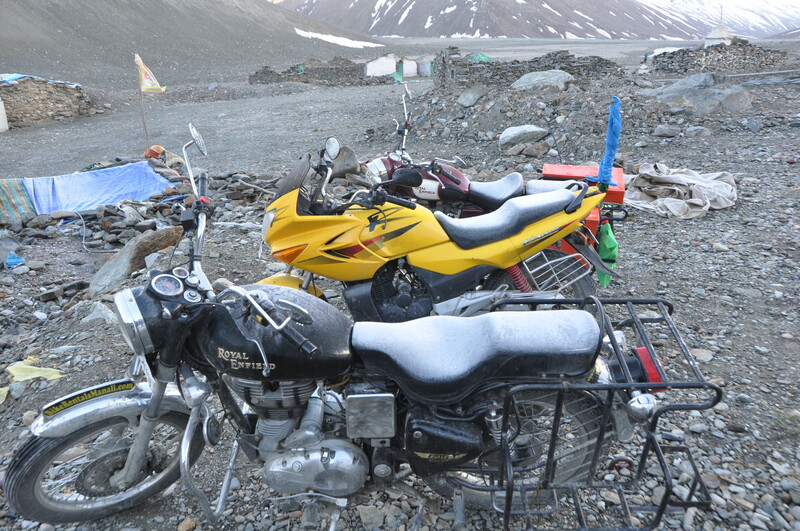 Six bikes thumped its way to embrace the glaciers. 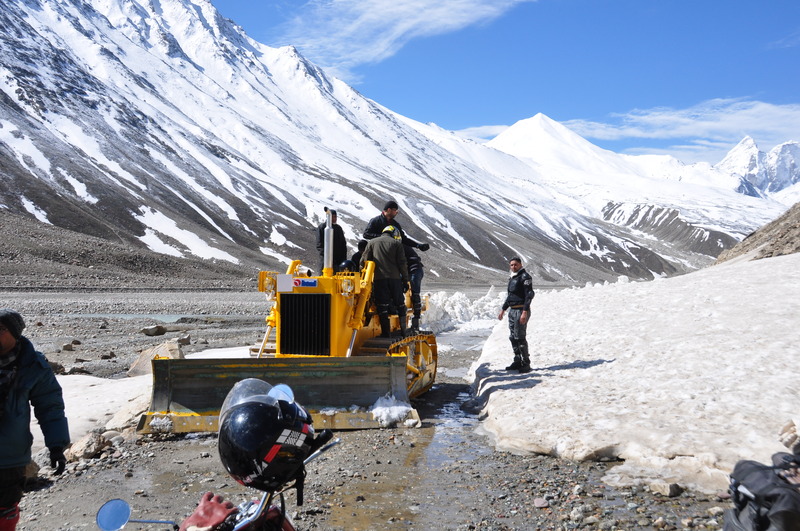 To our utter disappointment, the glaciers were not solid enough to push the bikes through. The snow started melting making it impossible to push the bikes across. It took six hours and mammoth effort to get all the bikes to safety. Tired and frustrated, we knew that for sure Chattru was our stop for the night. Mere 30kms later under rain and snow we reached Chattru. 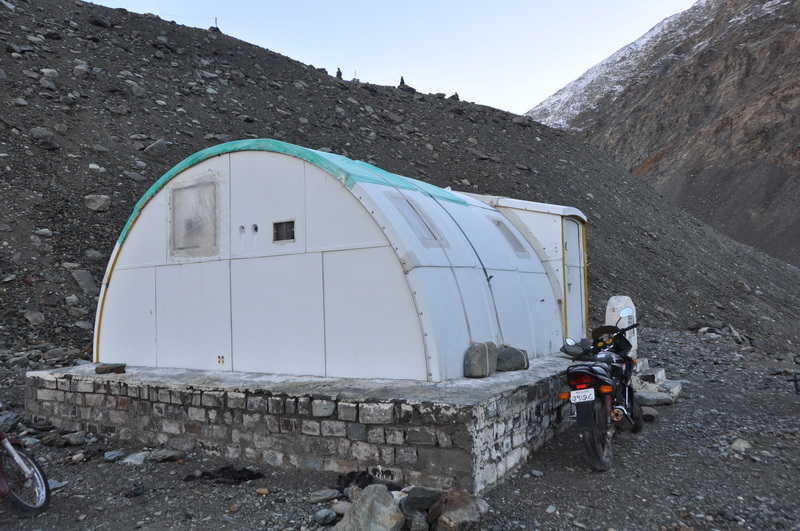 The Dhabas at Chattru provided us food and shelter. As we relaxed, I was able to strike up interesting conversations with other members to better acquaint myself. The evening was spent mostly for photography before we hit the sack. The following morning gave us the start we needed. 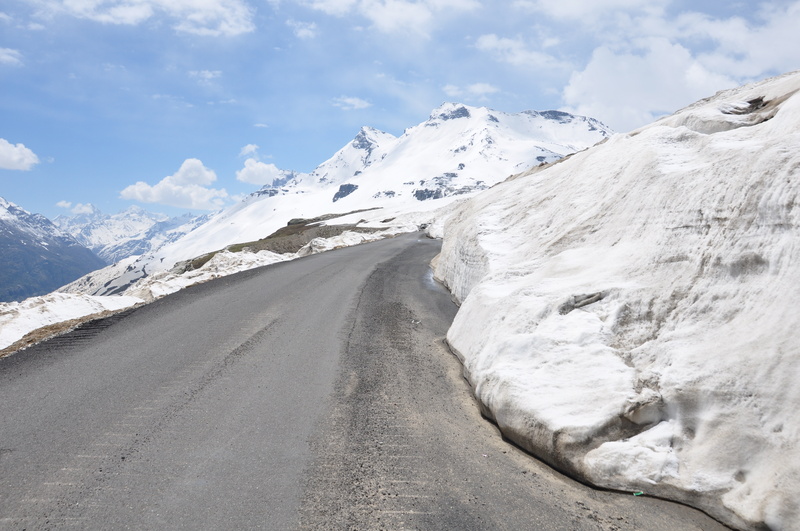 Sunshine lifted our spirits as we sped off to Rothang Pass to enter Manali. The dramatic week came to an end with sight of numerous tourist and noise reaching new decibel levels. I bid farewell to the group as I would be spending rest of my vacation in a small town called Nagar, while my friends would at Manali. The decent to Naggar via Rothang pass was miserable with traffic jams all long. The 4 hour descent finally ended at a little quaint road to Naggar. I was lost in a reverie, as a group of tourist was strumming the guitar to “you can’t always get what you want…..”. 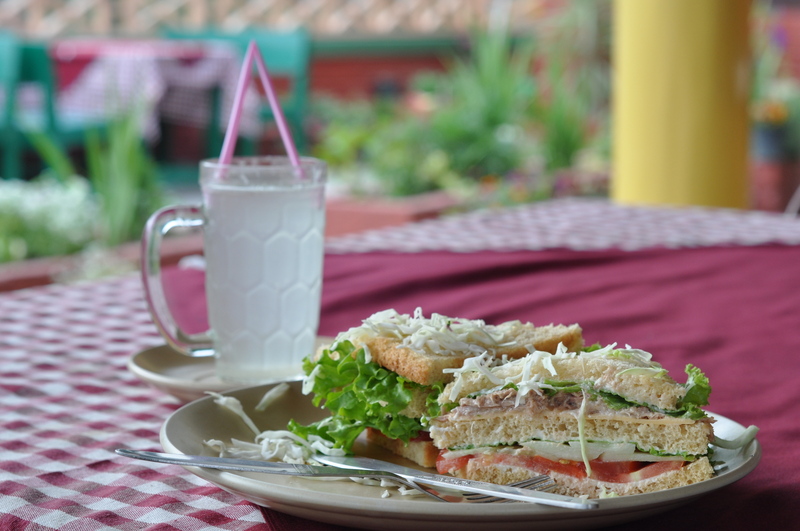 This entry was posted in Travel and tagged Road Trips, Trips. Bookmark the permalink. nice clicks seems had a great trip !! !